The Tijuana Xolos’ chances of making the playoffs are dwindling with every poor result as the Liga MX Clausura 2018 progresses. The Aztec Canines have not won in four consecutive games and some might suggest that it is time to panic. 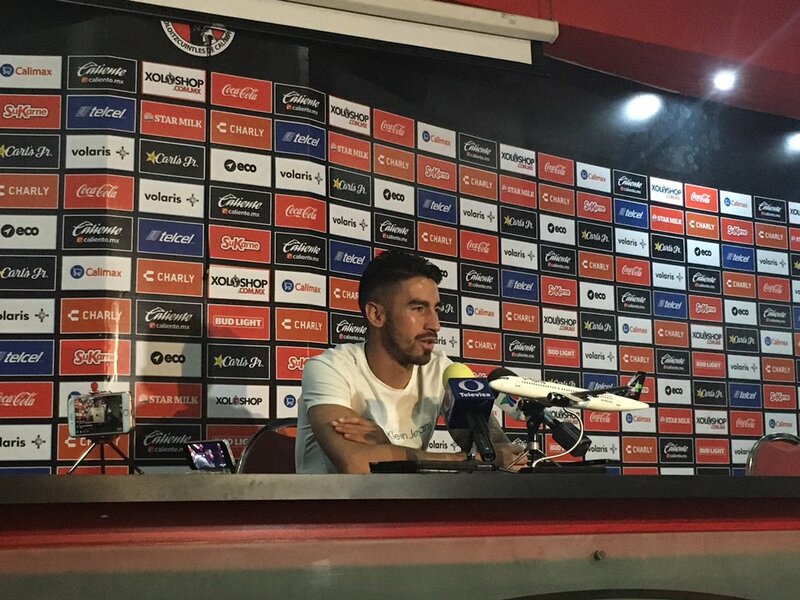 For Xolos’ striker, Juan Martin Lucero this is not the case as he demonstrated with his demeanor and responses in a press conference on Tuesday at the Estadio Caliente. The Argentine striker touched a few different subjects, but really pushed forward the idea that there is a sense of “tranquility” in the club. Depending on which way this ideology is perceived, it can be either a positive or negative, especially considering how competitive the Liga MX has been this semester. It is very clear that there is not this sense of tranquility among the fans as Club Tijuana was booed heavily after their latest game at the Estadio Caliente. The result was a disappointing 2-2 tie against the seventeenth-place team in the league, Atlas, in a game where the Xolos lost complete control. The 26-year-old was asked this Tuesday about his thoughts on the fans booing. Lucero said, “It’s understandable if you put yourself in their shoes.” The South American forward is used to very passionate fan bases in his native Argentina and must be used to these types of reactions by now. “El Gato” also spoke about the upcoming game against Chivas de Guadalajara that could decide the fate of the rest of the tournament for Club Tijuana. The Border City Dogs are still clinging to a playoff spot, but could easily be out of the postseason picture very soon. Lucero did say that “A victory will calm everything down”, in terms of the of the fans. There should be a plethora of Chivas’ fans at the Estadio Caliente this Friday, and Juan Lucero does realize this. Lucero said, “You see a lot of Chivas’ fans on the streets and it is a game that many people are anticipating. I hope that we can give them a spectacle and get a win for our fans that are always here”. “El Gato” is coming off a great game against Atlas where he scored and assisted a goal as well. It is unclear if he will start this upcoming match against Chivas de Guadalajara, but Diego Cocca should definitely consider him after the performance he put in against Los Zorros.